Last call for the stamps GB, solution to this! This is one last call I am giving for the four stamps GB, and I have a question to ask for EVERYONE who have claimed at least one stamp. Since not all were claimed, I am asking you whether it would be alright for you to spend some cents extra, so we will get all of these four sets. I have calculated it as fair as possible, so please take a look and let me know, if it would be alright for you! Every stamp set costs 30$. I have asked the seller for combined shipping, if it's true (and I have sent another message to the seller to confirm it's the same shipping), the shipping for all four would be 28$ by registered mail. Which means, 30$ + 7$ shipping for each of these sets.The way I would like to divide the payments are the amount of stamps/ink pads/boxes that were claimed in EACH of these sets. Now, since there will be a lot of unclaimed stamps, I WILL NOT claim them, I will give everybody a chance to claim a stamp for free, especially to those, who have claimed more stamps, or would have to pay a few more fees than others do. Which leads to overall, the more stamps are claimed, the cheaper it will get. I ship from CANADA and will ship to CANADA and USA only! I accept paypal, or concealed cash at your own risk! for this post...Shipping for flats starts at $0.50 for Canada, $1.00 for USA. Feel free to haggle, though these are already fair prices. Currently accepting trades... Feel free to inquire! --> WILL TRADE $1.00 in anything from my sales per kid! I refuse the right to sell to anyone I don't see fit. Any other questions? Please ask in the appropriate thread ^_^! A bit of a wants post..
-I've been buying packs upon packs of cards in hopes of finding the full-art holo card of N.
-I'd also like the card sleeves/any merch with N on it, especially official game art and the japanese trainer card. -Ingo/Emmett card sleeves are on the want list too. I can't be buying too much because I need to replace a tire on my car :( but getting a few things to satisfy my Nneed of N would be great. Just letting everyone know that I am putting my Beams Shiny Pikachu plush up for offers. I'm posting my Wants post on here. I'm looking for about, $3-5 for each one. One and only reminder post! Bidding ends in about 19 hours! The more we raise the better chance we have to win these rare plush if there some last minute competition on the auction. ♥ So if you are planning on raising your bid please do so soon so we have a good fighting chance, just in case! Click here to go to the auction page! First of all - our test-sticky is in place. Yes, I removed Dento's face from everyone else's faces! But don't tempt me!! Well, I won some Shiny Rayquaza goodies and am getting emails out the wazoo about them! So here they are! This is ALL I HAVE, no pickups, prizes only, unfortunately! I am not sure if I will get any more of these items. So this is it! And some fruit drop tins. You can combine any of these orders with 100 slot Charm Run orders! 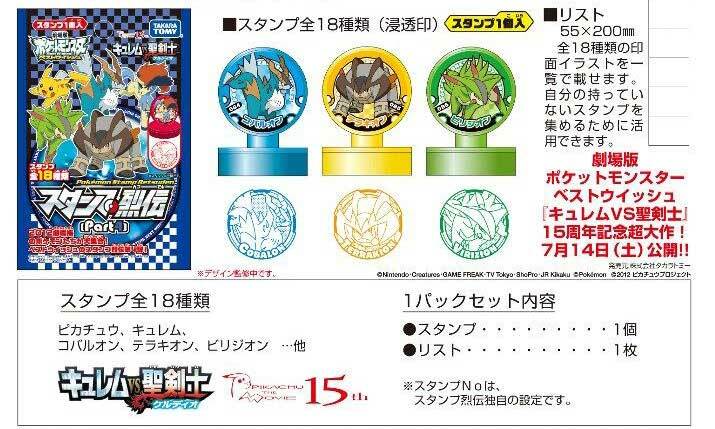 Black and White Kyurem are also getting their first merch on April 14th. Since it's identical to Keldeo's first merch... I think PokeCen plush aren't too far behind, YAY!! 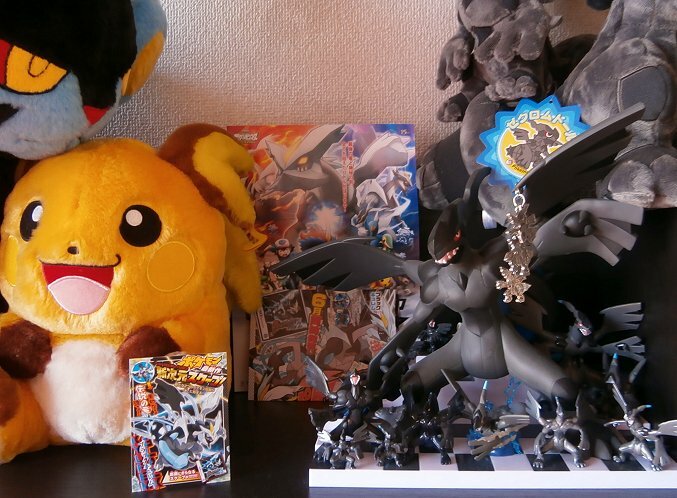 I am unashamed at how ready I am for Black Kyurem goodies!!! Due to the limited stock of these figures, I've asked permission from a mod to begin pre-orders for the museum figures early so everyone can get what they want. If you don't know what it is, its this! I'm looking for some 1:1 plushies from the Pokemon Center [I'm putting this in because I've seen people call 1:1 any large plush that.] I know that they range in the hundreds and are rare but I'm willing to pay, depending on the prices. I'm kinda kicking myself that I didn't buy the 1:1 Oshawott for 120 when I saw it and I was hoping maybe the seller [whoever you are!] still has it. 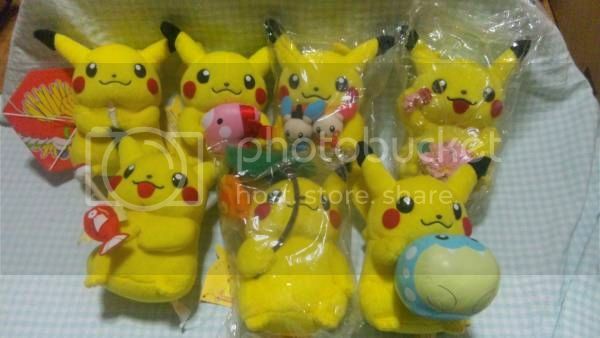 Other 1:1 plushs I'm looking for are Tepig and Dittochu. I know Unova got a bunch of 1:1 and there are some Pikachu ones. Does anyone know what they are? Or what Pokemon they are? Hello everyone I'm new to the community and would like to say hello to everyone. 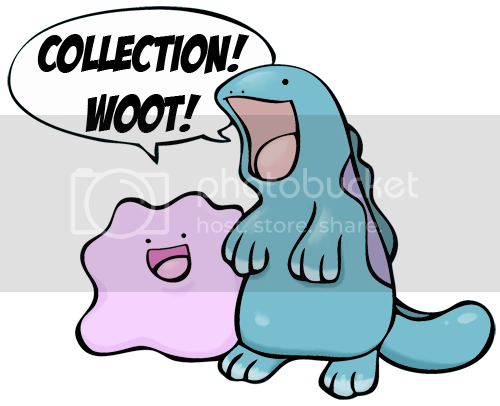 I enjoy collecting pokemon plushies of my favorite types of pokemon. Here are some picture under the cut. Also I need some help with identifying my Leafeon and Glaceon I recently received from ebay. Hey guys, I need some help with merch identification from Taiwan. Any help would be appreciated! I joined this community just a little bit ago and this (as the title says) is my first post. I'd originally wanted it to be a photo of my whole collection but got this guy the other day and can't resist sharing! Also, it's worth mentioning that I HAVE added a couple things to my normal sales. Namely, Raikou and Suicune keychains and Aipom, Smeargle, and Teddiursa magnets. There's still a couple Zoroark pencil boards, custom Lumineon plush, custom Flareon and Leafeon sculptures, and a bunch of misc things in the post. Re-intro! + has anyone heard from elisha1288? Most of you will remember me as johtofire, but I have now changed my account to mijuchan! So, on to my collection! Has anyone heard anything from elisha1288 lately? I haven't been in contact with her for some time now, and I would like to know what's going on. Does anyone have a Gyarados Zukan willing to sale? Just a heads up, my customs auction will be ending in about 24 hours. That means you have another day to browse and bid. Most items have no bids and most of them start at $1! Hi all, I updated my sales with some new flats and reduced prices on some figures as well. Come take a look! She a bootie? Or not a bootie? Also her tag was Grey and White.I've heard of 2005 Japan pre-order with the XD logo,and 2009 U.S.A but not 2006. Hey everyone!! Sorry for such a short/useless sort of post. Claims for the 100 slot charms pick up will be closing this coming Tuesday, the 20th, right at midnight PST! There still a good amount of slots open (35+ at the time of posting this!) so if you were still undecided, now is the time to claim a couple if you choose! EDIT: HEY I know what to make this post less useless!!! Here's the set list for a new set of Kids in June! aaand a new set of RETSUDEN STAMPS!!! Pikachu, Cobalion, Terrakion, Virizion, Keldeo and Kyurem only confirmed for now! Hooray! I'm back from Osaka! :D Results and totals under the cut, pictures of my new gets, and a few Osaka PC leftovers/rayquaza lottery prizes up for sale. My collection has grown quite a bit since last time I posted and I wanted to make a more permanent post showcasing each figure individually! (possibly excessively so) Not all the info and commentary is done but I've put in a lot of work so far and wanted to share! Click the Pics to go! Also, my actions for the following are ending tomorrow! I hope everyone is having a great St. Patricks Day! I know it says on the All About Pokemon Figure (AAPF) site that the release date is the fifth week of September 2012, but wanted to know if anyone had anymore info about it . Sorry to be a nuisance. :p We're interested in these types of Tomy plushes. So I thought since it's been quite while since I've done a collection update of sorts, I'd take photos of some of my smaller items, including my lovely Vulpix collection, as well as all my other little collections. I don't have a lot of my plush with me at my apartment, so I'll have to do another update for them sometime!